A reverse of the previous meeting between the sides – the only goal came from the penalty spot in another disappointing contest. Antonio Conte continued with the 3-5-1-1 that worked excellently away at Lazio, with Giorgio Chiellini returningin place of Federico Peluso. Max Allegri was still without Mario Balotelli, and Mathieu Flamini was also banned. Massimo Ambrosini played the deep midfield role, with Riccardo Montolivo to the right and Kevin-Prince Boateng to the left. This was a slow-paced, attritional contest with little technical quality – most shots were from long-range. Juve’s new 3-5-1-1 system isn’t an entirely different shape from their 3-5-2, of course. It’s a nice solution because Paul Pogba’s excellent performances have forced Conte to field him regularly from the start, while Claudio Marchisio’s game isn’t significantly altered by starting higher up the pitch. The main feature of Juve’s attacking play – clever movement and combinations between the front two – is still possible. However, the surprising thing about the midfield battle was that, throughout the first half, Milan dominated the centre ground despite theoretically having a 3 v 4 disadvantage in that zone. It was odd that Juventus were so overrun in the middle of the park – the presence of an extra midfielder should have resulted in them dominating possession. An interesting part of Milan’s possession play was that, with Mirko Vucinic remaining close to Cristian Zapata, Philippe Mexes was free to move forward on the ball and hit good passes into midfield, whereas Zapata only played square balls. Milan had an interesting approach when it came to Andrea Pirlo, who remains Juve’s most important player. When Gianluigi Buffon had the ball, Milan moved forward and pressed the Juve defence 3 v 3 – and one of the midfielders, usually Montolivo, would push up and get tight to Pirlo. At least twice, Buffon passed the ball forward to Pirlo under pressure, and he played a blind pass straight to an opponent. That pressing was a feature of Bayern’s gameplan against Juve, although Milan also pressed very effectively in the reverse meeting between the sides. However, once Juve had got the ball forward and played it into the midfield zone, Pirlo was left completely free. 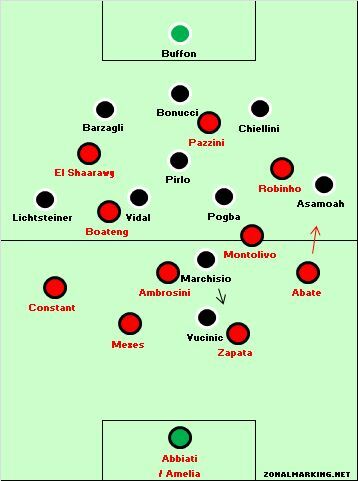 Ambrosini was close to Marchisio, Montolivo on Pogba and Boateng against Vidal. Although Giampaolo Pazzini gradually moved towards his own goal to pressure Pirlo, he hardly ever got goalside – and therefore while Pirlo was struggling in his own third of the pitch, he had the run of the centre ground. It was surprising Allegri didn’t replicate the system he used in Milan’s 1-0 win over Juve earlier in the season, with Boateng as a false nine pressuring Pirlo – Sulley Muntari, who was forced to replace Ambrosini through injury at half-time anyway, could have played Boateng’s central midfield role. 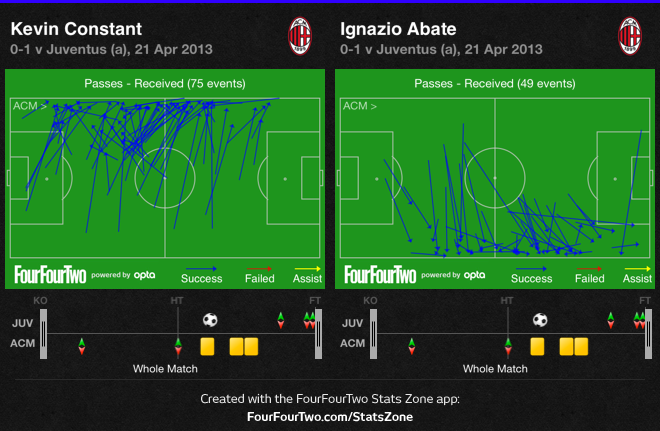 However, a couple of times Juventus had a problem at defensive transitions. With Vucinic alone upfront – even if Marchisio was in close support – it felt like more Juventus midfielders had a responsibility to support him. At one point, Marchisio, Vidal and Pogba all made forward runs in advance of the Montenegrin, but when he lost the ball, Juve found themselves with three of their four midfielders out of the game, and Pirlo alone in front of the defence trying to stop a Milan break. With the midfield zone neutralised aside from Pirlo – who looked to pass to the flank anyways – and both Vucinic and Pazzini quiet, the wings seemed to be an important area of the pitch. This was where Milan, in their 4-3-3 system, really should have thrived – but both Robinho and Stephan El Shaarawy were quiet, unable to collect the ball on the run to motor past Juve’s outside centre-backs, which is what they’d done excellently in the reverse game. However, with Juve’s centre-backs often occupied, there was space for Milan’s full-backs to get forward. Ignazio Abate was significantly more attacking than Kevin Constant, and good balls from Montolivo found him racing down the flank a couple of times – although he could never quite find the right cross. There was a strong feeling that the first goal would decide the game – eventually it came from the penalty spot. However, the move leading to the goal was interesting – Pirlo knocked a hopeful ball in behind Abate, who defended it poorly, and Kwadwo Asamoah raced in behind where he was brought down by substitute goalkeeper Marco Amelia. It was something of a freak incident – Pirlo’s ball, in truth, had been misplaced – but it did show where Milan were vulnerable. First because they allowed Pirlo time on the ball, second because Abate isn’t a very good full-back in a defensive sense. 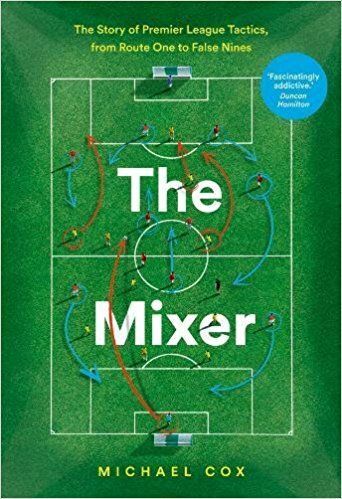 There was only one substitution of any consequence – on 70 minutes Bojan Krkic replaced Robinho, and Milan went to a 4-2-3-1 system, with Boateng moving to the right flank, and Bojan as the number ten. Allegri has often fielded Bojan in that role this season, but you can’t help feeling he’s uncomfortable there, and more suited to the front trio. The switch changed little as Juve sat deep. Conte brought on Simone Padoin for Stephane Lichtsteiner for fresh legs on the right, then made two time-wasting substitutions in injury time. Juventus weren’t significantly troubled. Serie A meetings between these two have been particularly dull in recent years, and this was another underwhelming clash with little creativity or attacking spark from either side. The centre-forwards weren’t involved, the midfield was too cramped, and there was a lot of onus upon the full-backs/wing-backs for attacking drive. The key feature of the game was Pirlo – Milan pressed him at goal-kicks, but left him free in midfield. It seemed a goal would arrive either from him conceding possession on the edge of his own box, or knocking a clever pass into the opposition box. In the end, in a roundabout way, it was the latter. Juventus are now four points from the title with five games remaining. They have may been convincingly defeated in the Champions League by Bayern, but considering that was Conte’s first European campaign, and they’ve successfully defended their title, this still qualifies as an excellent season. I thought the Milan game plan was to try to dominate possession and pin Juve back into their half as much as possible. This was a game Milan probably needed to secure some points and to keep it tight for as long as possible suited Juve a little more, but Milan would have been happy with that first half performance. I think the 2 forced injuries from the first half for Milan were the turning point, as from there Muntari came on and forced a complete reshuffle of the mid with Montolivo and Boateng moving away from their roles in the first half. Muntari was nowhere near as composed on the ball and offered far less defensively than Ambrosini, and Montolivo who is the most effective presser that Milan has was put infront of the defence. Without the injuries, the second half might have been an entirely different proposition. Milan would have been able to use the bench to introduce some spark if they still needed to score or Muntari could have came on to shore up the team defensively. All in all, a little disappointing to see a sensible gameplan ruined due to injuries. Oh, and Abbiati is the most injury prone keeper ever, and it always seems as if he gets injured in game as well. By the way, Vidal’s penalty was the best I’ve ever seen. Hit with power, top corner, top-notch accuracy. Michael, I have seen that you have been found of the brazilian diamondish, benficas diamond, and czechs diamond. So I wonder, what would be your favourite formation, if you could pick and choose players like a national team. Would you like to overload the midfield. Would you like to press high, or low and counter attack? What do you think about the Villarreal/arsenal/city 4 2 2 2 system? As for Barcelona, I see it as they in most games plays a 3 2 4 1 in attack, with xavi joining attack, and iniesta joing midfield in defence. 4 1 4 1. Either Busi or Dani plays an combi role to make this transition. I’m wondering, Pirlo wasn’t really pressed when Juve had the ball, how much of this can be accredited to Juve fielding 4 midfielders and drawing the attention away from Pirlo? Or was it a deliberate tactical approach from Allegri? For me it seemed Milan was trying to reduce the passing options for Pirlo rather than man mark him. Juventus really need to look to change to a 3-5-1-1 as their primary formation and look to bring in a more horizontal #10. Llorente can occupy 2 central defenders, hold the ball up, and link play. Have Marchisio and Vidal as the CMs and start to phase in Pogba deep (to take over permanently in 2 sesons). Maybe Christian Erikson? come on do you really think that this game was worth the analysis . the current milan side must be the worst side . there best player is boetang who cannot do a half turn or be a creator . pazzini ( i know you praised him in one of your articles last year when he played for inter ) cannot hold the ball cannot run with it cant win aerial battles cant cross what is he use of . whenever montolivo has the ball he wants to make a 40 yrd pass and wants to emulate pirlo . there is no creativity in the side no pace and nothing to be honest i wasted my sleep watching this match . most importantly arsene wenger is right that you switch off your sets after 20 mins. as per as juve goes let me that defeat at the hands of bayern was a result not because they defended poorly but because they just play one way and if the opposition just sits deep and defend properly then they dont have that fluidity to open defenses which all the top teams have . to be honest dont ever consider milan to be a top side anymore and stop your fascination with italian football . just because they line differently doesnt means they play fluidly or defend properly . English teams are not solid enough defensively to win Europe. Spain and Germany are dominated by two teams. France overly emphasizes physicality. juventus should have played 3-5-1-1 against bayern, and their midfield wouldn’t have been dominated. with constant, I felt he was the more attacking fullback in the second half. He made good runs, but his crossing was horrible. The key to beating this Juventus team was width. When Milan played wider, they looked more dangerous. 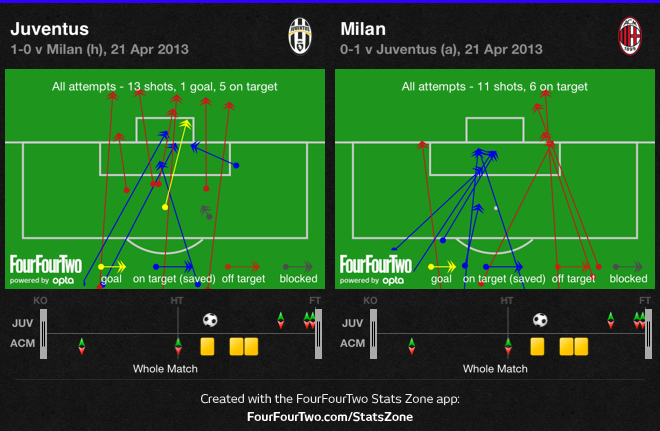 When they tried to penetrate the defence it was almost impossible, juventus had clogged the central areas. In Serie A, however, there are no great wingers to test juventus, that’s why they can play so narrow in defence. Michael, do you think Juves back 3 is holding them back in the CL? It suits their players well, and they will probably get 1-2 more quality players in the summer, but I cant help but feel that 4-3-3 would be the way to go. Atleast in the big games. Against Bayern the back three just couldn’t cope with the high pressing and were frequently exposed down the flanks. Almost perfect tactically, Antonio Conte’s Juventus. 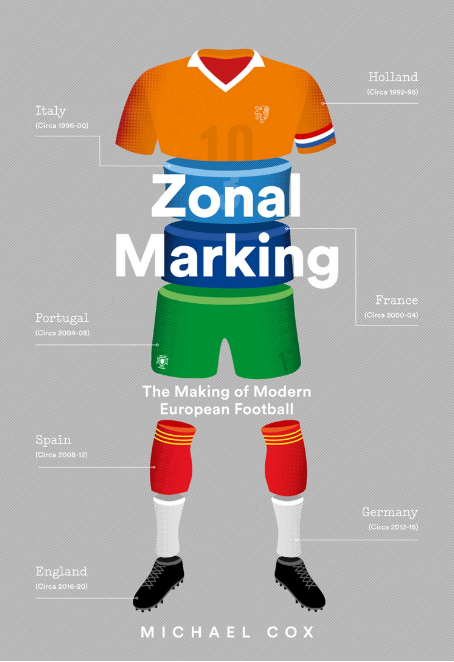 What about Benfica-Sporting, Zonal Marking? I will be trying to find suggestions about how you can improve the volume of comments on my own weblog, just how do you achieve achieving this? and marketing style and growing self-confidence using your work. Find out how to be a way consultant.Receiving further training will open job options making it simpler to interrupt in to the industry.